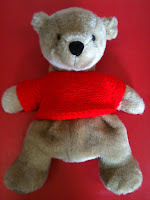 During our topic on Bears in September, we will introduce a new friend to the children in the form of our resident teddy bear called Samuel. The children have the opportunity to take home the bear from one session to the next and share some time with him: They will be able to take Samuel on visits perhaps to relatives or friends, going on outings, attend birthday parties, share bedtime stories or just play with him. We will ask you to sign your child’s name in teddy Samuel’s diary (kept on the registration desk) on a day that is suitable for you and your child to take him home. Write in his special book any experiences your child has with him in the form of a simple sentence, a picture your child might enjoy drawing or even a photograph. On returning teddy Samuel to nursery your child will be able to share their experience with the other children in their story group time with their key worker. We are hoping this will be a new venture to be enjoyed by the children in caring for teddy Samuel and having lots of fun with him.